Britain's biggest fish appears to be moving to Scottish waters - and experts say it may be down to global warming. Sightings of basking sharks are up 65% off the Scottish coast since 2001, but down 66% in south-west England, the Marine Conservation Society (MCS) says. It has studied the sharks for 17 years, relying on sightings from the public. MCS scientists believe the sharks, which can grow to 12m, are following plankton, their main food, northwards in a search for cooler waters. Dr Jean-Luc Solandt, MCS biodiversity policy officer, said the study had provided "exciting insights" into shark movement. "We already know that rising sea temperatures are affecting the distribution of plankton in UK waters and may in fact be making Scottish seas more favourable for the sharks," he said. Between 1987 and 2004, MCS Basking Shark Watch received 6,511 reports on sightings of sharks from divers, fishermen, sailors and coastal walkers. They recorded the sharks feeding, courting and even jumping clear out of the water. The report provides evidence of the most likely locations for shark activity in UK waters. The prime locations have traditionally been south-west England and the Isle of Man. But now it appears the best places to encounter a basking shark are the Hebrides, the Minches, Shetland and the Clyde coast. Green campaigners believe the presence of the sharks brings economic benefits as eco-tourism is worth at least £57m to the Scottish economy. "With Scotland on track to become Europe's number-one wildlife destination, these results will be of interest to wildlife-watching boat operators," MCS Scottish officer Calum Duncan said. Basking sharks can weigh more than five tonnes, and can filter sea water equivalent to that held in an Olympic-sized swimming pool every hour. 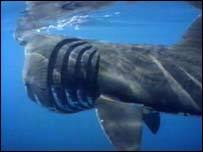 Details of the increased shark numbers emerged as plans were unveiled for a marine national park off Scotland's coast.